So we came back home from our Vancouver trip loaded down with new cookbooks, and of course I had to immediately find something new to cook. 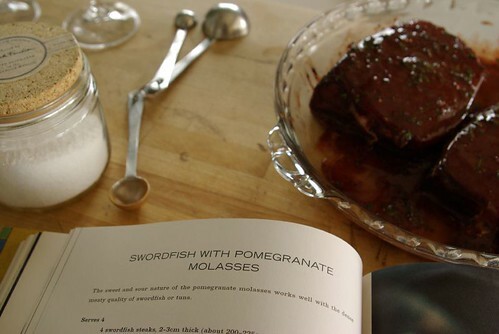 The first recipe that jumped out at me was a pomegranate molasses-marinated swordfish from the Casa Moro cookbook. Hey, I thought, we still have pomegranate molasses! And, as fate would have it, we were able to buy big fat steaks of Hawaiian marlin at the store – plus the weather was good enough for outdoor grilling! To go along with the fish, the book recommended a pilaf, so I tried out the Moro recipe for rice with dill and pine nuts. It involved rinsing and then soaking basmati rice so that it took very little cooking – not a technique that I’d tried before, but it worked like a charm. 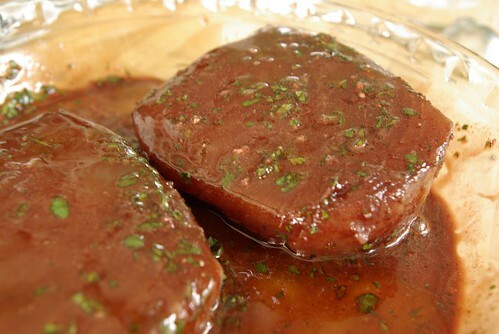 About two hours ahead of time, I combined pomegranate molasses, cinnamon, cilantro, garlic and salt in a pie pan and rubbed it all over the fish steaks, which then went back into the fridge. Then I measured out the rice, rinsed it several times and set it to soak in warm water and salt. 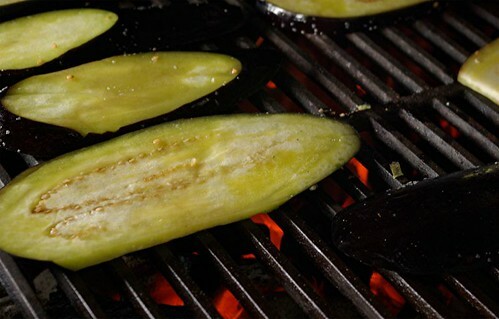 J got the grill started, then sliced eggplant and rubbed it with olive oil and salt. 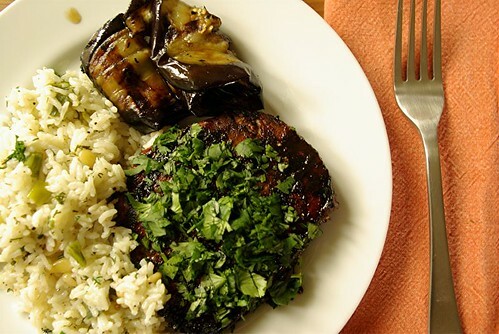 Once the grill was ready and J was starting to cook up the eggplant for a side dish, I melted some butter and tossed in freshly ground allspice and chopped dill. 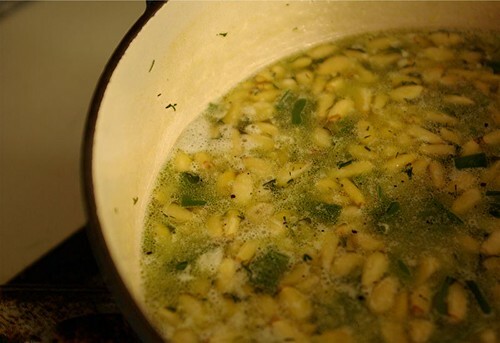 A minute later I added the drained rice and a quarter cup or so of pine nuts and stirred it all up well, then added water until it was just above the level of the rice. This all got brought to a full boil, then I put the lid on the pot and let it cook at medium heat for five minutes, then turned the heat to low and waited another five minutes. Much to my surprise, at that point the rice was perfectly done! J grilled the fish and brought it upstairs with the eggplant, and we had a really fantastic dinner. The flavors were very mild, but delicious and beautifully matched to each other. The pilaf especially was amazing – must experiment further with this recipe.